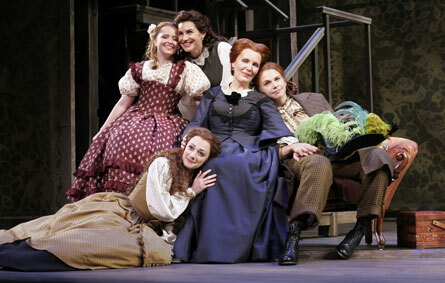 Ticket sales for "Little Women" had already been brisk from the buzz: The Louisa May Alcott classic children's book turned Broadway musical stars Maureen McGovern and Kate Fisher, and kicks off a 32-city tour right here in San Diego. Maureen McGovern (center) is surrounded by the brood of March sisters in "Little Women," opening tonight at the San Diego Civic Theatre. But tickets are even harder to come by now. The show, which was set to open Tuesday, was postponed due to set damage caused by the fire at the San Diego Civic Theatre on Aug. 18. "In the worst cliche in the world, 'the show must go on' is appropriate in this case," said Joe Kobryner, general manager of Broadway/San Diego, the organization that brings touring Broadway programs to town. And the show will go on -- it opens Friday at 7:30 p.m. at the Civic Theatre and runs through the weekend. "Little Women" is the story of the four young March sisters, trying to find their place in the world while their father is off at war. Though set in Civil War-era New England, the tale hits close to home for San Diegans, many of whom await the return of loved ones serving in the Middle East. But Director Susan Schulman says the musical will likely resonate with contemporary audiences in other ways. "I don't think a woman trying to raise her daughters by herself is quaint or old fashioned," said Schulman. "Certainly there are many single mothers today." Alcott's classic novel was originally published in 1869, at a time when women had clearly defined roles. "Little Women" has never been out of print, and one reason the book has remained so popular -- especially among adolescent girls -- is that protagonist Jo struggles with the still topical questions of autonomy, marriage and career. "Jo has become such a character to live through the ages because she was well ahead of time, in what she was striving for and the kind of independence and security she wanted to get for herself," Schulman said. "She didn't think she could have a career and a home, and a marriage and children. Of course, women face this every day today. How do they manage all of that, can they have it all? What is acceptable, what is not acceptable?" For the touring production, Katie Fisher steps into the pivotal role of Jo, played on Broadway by Sutton Foster. Fisher played Cosette in Broadway and touring productions of "Les Miserables." "We were very fortunate with Katie Fisher," said Schulman. "She's just fearless, which we adore. She's very funny, and she has the ability to really envelope this character." But the story isn't just appealing to "little women." The universal themes encompass "the stuff of families, the stuff of life," said Maureen McGovern, who reprises her role as matriarch Marmee. "To find a great story these days is really hard," she said. "This is a classic, quintessential coming of age story for anyone who's ever had dream and had to pull themselves up by the bootstraps and go forward. It's very inspiring." Over her 33-year career, McGovern, the ultimate crossover artist, has recorded a dozen albums covering a range of styles, from jazz, blues and swing to classical, folk and pop. "What I love about Marmee's character is she's sort of the best of all our mothers," McGovern said. "The challenge is to make her not saccharine, not one-dimensional. "She's both parents. In her songs she shows vulnerability, but otherwise she has to be the strength. But she also has a wicked sense of humor, she's fair and compassionate." McGovern also gets two of the most powerful, moving songs in the show, which features a book by Allan Knee, lyrics by Mindi Dickstein and music by Jason Howland. She was nominated for a Drama Desk Award for the role in the Broadway production. "I love the role, love the piece," McGovern said. "Mindi Dickstein and Jason Howland have given me two of the most gorgeous songs I could imagine singing in theater." The musical gives audiences an opportunity to get reacquainted with old friends or discover the story for the first time. Those who are familiar with Alcott's book won't be surprised by the condensed stage version -- the main plot points are still there -- but they may be "very surprised at how much fun it is, and how romantic it is," said Schulman. "The show has a lot of true emotion in it and a lot of honest sentiment," she said. "There's so much joy and passion in the character of Jo, so much humor. It's a great entertainment value. And you do leave theater feeling better." Show times: Tonight at 7:30 p.m., Saturday at 2 and 7:30 p.m., and Sunday at 1 and 6 p.m.